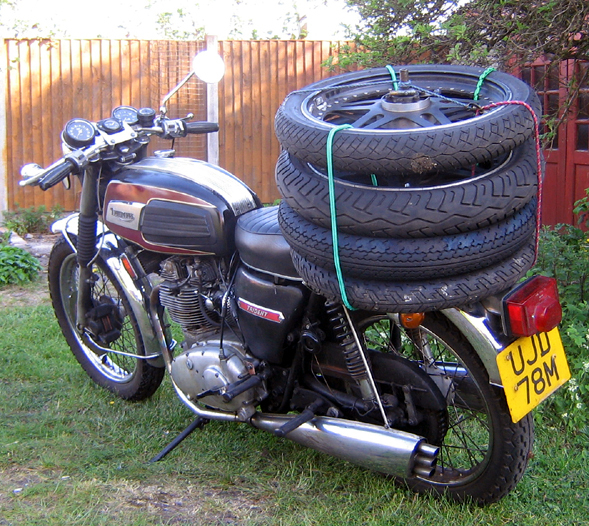 Off to get the racing tyres refitted to the Daytona, after running in new parts on the road. Into May, and finally we've had some racing. The plans to have both bikes ready in plenty of time ran foul of all manner of strange mechanical and electrical problems, some of which I have not seen in all my long years, and there is still an element of make-do-and-hope in both bikes. 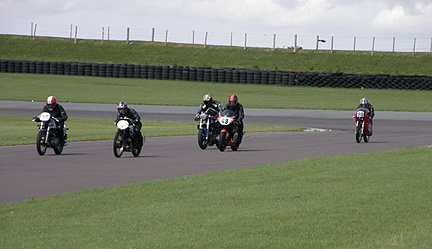 There was no way they were going to be fit for Pembrey at Easter, so first outing was at Mallory Park on 2nd May. 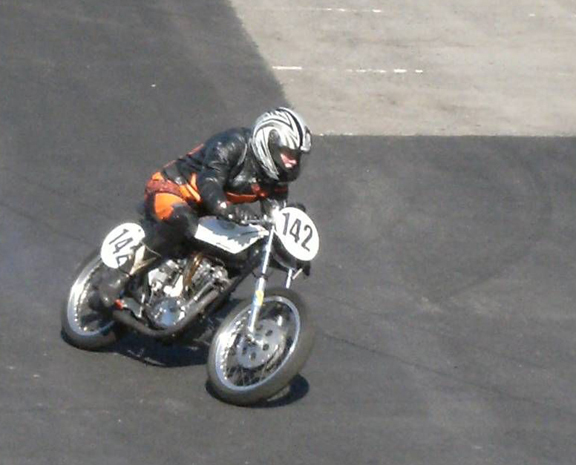 The Cub bent a valve in practice and was out for the day, and while the Daytona felt fast it was not as fast as most of the opposition, not with me on it at any rate. Oh dear oh dear. The shiny bits on the valve and piston are where they hit each other. That's not meant to happen. And so to the Thundersprint. Sally's road Cub having been cannibalised for its exhaust valve, the racing Cub was back together and looking shiny, but still had one or two worrying noises and the oil was circulating but very sluggishly despite a new pump and much checking of oilways. The plan had been to avoid anything experimental so close to the race, but a Daytona spring was now fitted to hopefully keep the errant valve under better control. It only had to survive five blasts of 440 yards and a gentle potter round Northwich in the cavalcade between practice and racing, not too much to ask? Come the day and there were lots of extra bikes in the 200cc class, a dozen this time, including the racing Yamaha that was the usual class winner. A much faster bike with a good rider, it duly won. The German MZ that came so close to winning came second, and I came third. 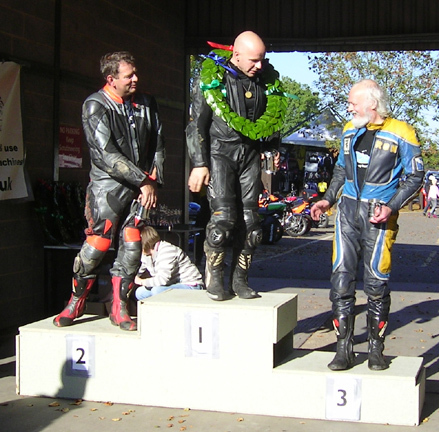 The trophies were divided between best 125, best 175 and best 200 which worked out as the three of us, so we all came away happy anyway. I was principally pleased that I had gone a second faster than last year, gearing the bike down for the occasion had worked a treat, and if I can get the first and last bends just a bit better sorted, there is another second to lose yet. Roll on next year. Meanwhile the engine is apart again in search of that elusive oil pressure. Two months later and we are still edging our way towards the next race. Meanwhile there have been two chances to try the bikes out. 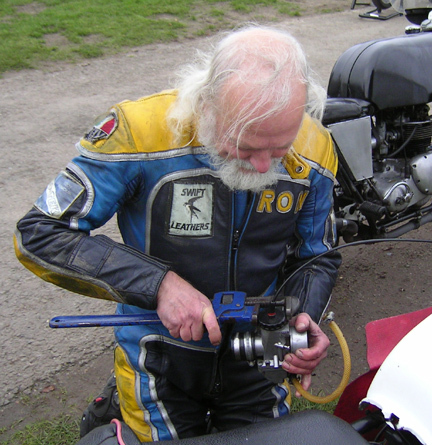 At the Festival of 1000 Bikes at Mallory Park the Cub had revised gas-flowing and, following the success of trying a new valve spring at the Thundersprint, two of the same type were due to be fitted. They did look perilously close to being coil-bound, though, (which is bad), and this was confirmed when a bit of the engine snapped under the strain with three days to go. Back to the drawing board, and some rather savage spring-shortening. Would it work now? The answer was Yes, so after Mallory the head was off again to do a more carefully measured and executed version of the exercise. The Daytona was also going OK but the exhausts were blowing near the head, slowing it near the end of the session and making it sound like a tractor. This turned out to be the 32 year old custom-made exhaust pipe rusting through, necessitating a fairly thorough bodge, which will hopefully hold for a while. Getting new pipes made up is likely to prove expensive. And so to the Beezumph Rally, this year in Anglesey where it was expected to be wet and windy. 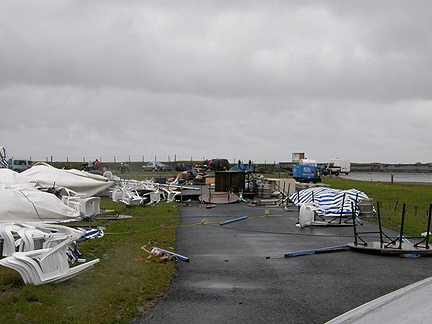 The hurricane force winds of Thursday night caught us all out, though, with our return to the van from the clubhouse greeted by the site of the tent housing the bikes and tools trying to take off, the bikes both lying on their sides. 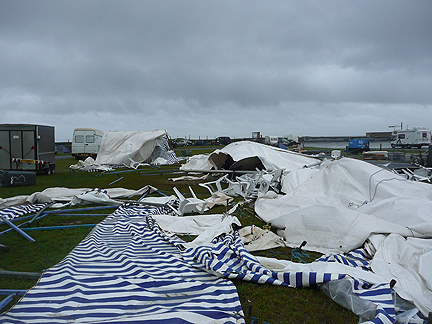 The tent was swiftly dismantled and stuffed into the front of the van, at least we were sleeping in the back, most people in tents were already homeless. 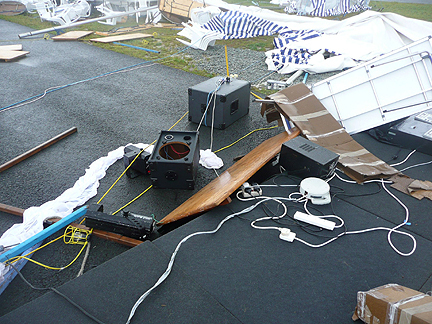 In the early hours of the morning the entertainment marquee headed for the Menai Straights, with tables, chairs and PA system scattered across the track. The devastation after the night before! 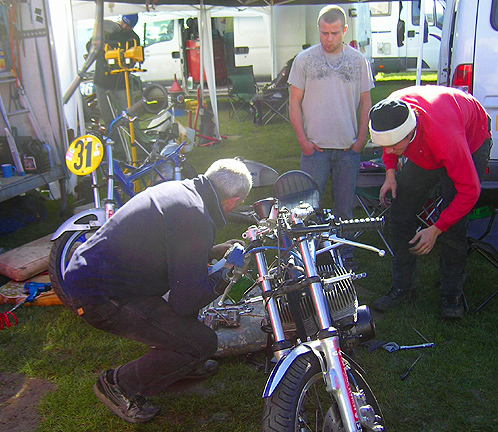 I had leant the bikes against the van and they survived the rest of the night - they just had to have a couple of bits straightened and the water emptied out of the carburettors. With the weather improving steadily through the morning the rally organisers and circuit staff rose to the challenge and by lunchtime we were out on the track. The Daytona no longer sounded like a tractor but was going like a dog. 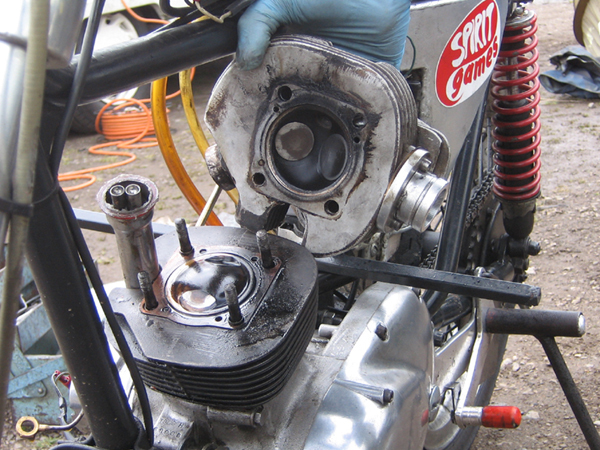 A further check of the carburettors did not improve things but a look at the timing revealed a 30 degree discrepancy! With that sorted, the bike positively flew in the last session of the day. The track has a terrific selection of bends, and I had started to get the hang of some of them so was looking forward to Saturday's sessions. There were several ex-GP Daytonas there to match mine against; in the first session I was happy to go round in the company of a Norton Rotary, then got myself ready in plenty of time to get lined up alongside the other 500 Triumphs for the next stint. Sally was cleaning the mud off the tyres - the paddock area had had plenty more overnight rain - when she spotted the head of a screw embedded in the front tread. It was holding the tyre pressure perfectly well but whether it would always do so when under the strain of repeated heavy braking was another matter. So it had to come out, the tyre went down, and with no tyre companies to hand, that was it. I could perhaps have scrounged a tube and some tyre levers from someone, but the tyre normally runs tubeless and I wouldn't want to risk damaging the long out of production Astralite wheel without the proper kit. An interesting weekend. The fact that the meeting happened at all was a triumph in itself, at the beginning of the month there were still huge holes in the track, the speed of the repairs being possible only because the lease has been bought by building contractors. So, instead of needing to put work out to tender and draw up careful contracts, they just turned up with shovels, picks and JCB's and got it sorted. Of course, there was still safety and licensing paperwork to be filled in and approved, with the last i dotted with less than 48 hours to go. Exciting stuff - as was the racing. Friday morning: out in the very first practice session, on a damp, repaired track that had not been rubbered in for 10 months, I was suitably cautious on the Daytona, ditto shortly afterwards on the Cub. For the third practice session it was fully wet, which is easier to judge, so I was steadily increasing the speed right up to when I fell off under braking, to my surprise. I had thought that a brand new medium compound tyre would be as good as a two year old softer compound version, but it turns out I was wrong, and some tyre swapping was arranged later. 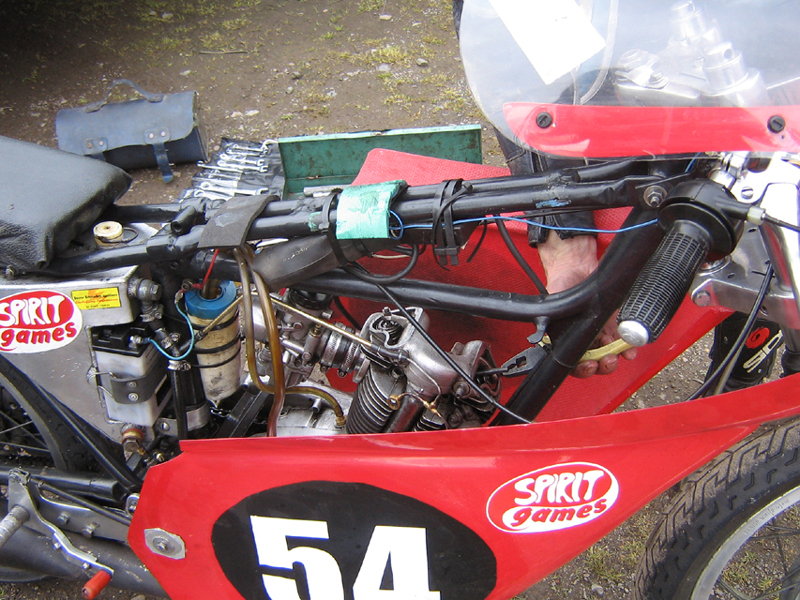 The Cub needed its head removing to sort an oil leak, and the Daytona needed a replacement front brake hose fitting as well as much mud removing - miraculously, the fairing was unbroken and other bits were not bent enough to matter. I had taken the precaution of being half a stone overweight so was adequately padded. 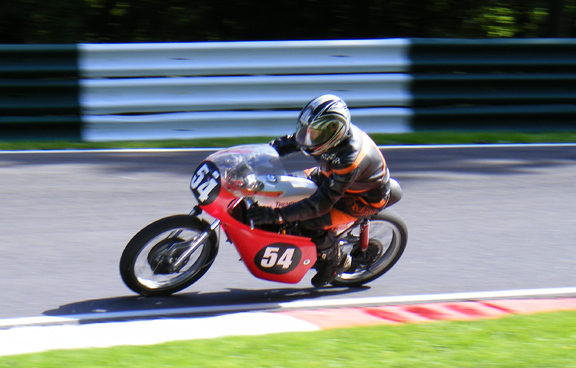 But getting the brake to work properly and getting the Cub back together took all afternoon instead of the hoped-for hour or two, so the first two races were missed. 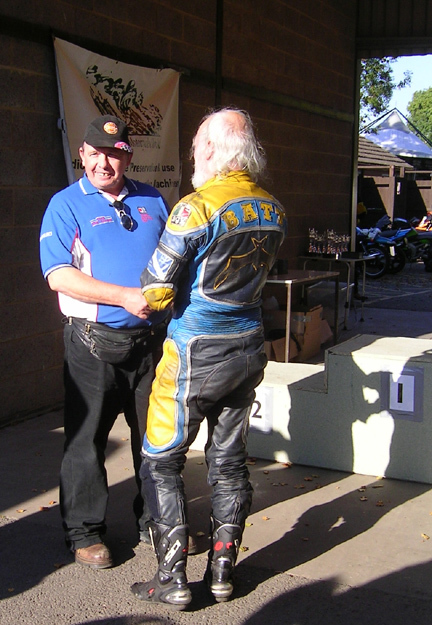 My next races were due on Saturday so I was able to have an early beer; the weather cleared up in the evening, and we took a stroll round the paddock being sociable. 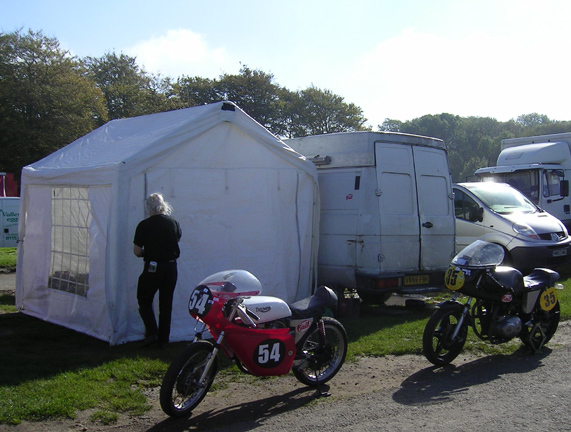 The Morini Riders Club annual trip to Cadwell Park was an ideal opportunity to get the bikes sorted ready for the last race of the season at the self same track in October. 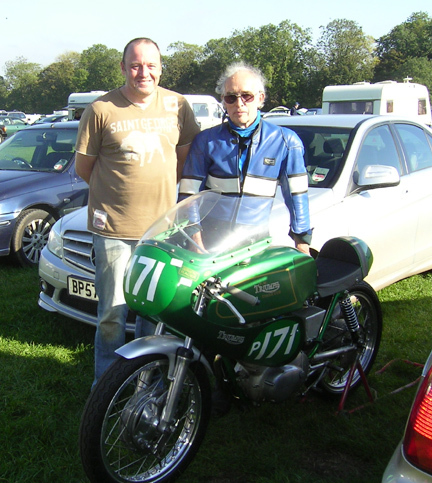 There had been a plan to also go to the penultimate race at Snetterton in September, as Jenny had expected her Honda racer to be delivered and it was to be her first race, but it came as a kit of parts with a few months work due yet. 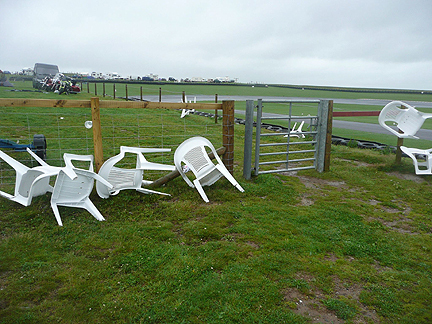 And Sally is still traumatised by memories of Snetterton from the Seventies, with the arctic wind bringing a particular sting to the rain. Also, there was a rather fine Large Model Aircraft display just down the road from here, with free entry by going on the '73 Trident to add to the vehicle display, several hundred Pounds cheaper than a weekend's racing which makes a difference in these tricky times. Jenny had a go on it to at least get a feel for the 200cc class and to inspire her to get cracking on the Honda build, and enjoyed it suitably. The only concern now is that, when all's said and done, I was still 5 seconds slower than the best time at Cadwell last year, rather than the 5 seconds faster which all the time and money spent was supposed to produce. Not all of this is due to advancing old age, since times on the Daytona were the same as last year. And it is 1,000 revs down on the straight, so if I can find where they have gone there is yet hope of a decent result. If I can get the rev counter to work on the Cub, maybe I'll find an excuse for the poor performance on that one too, though I'm running out of ideas of how to make it go faster other than pedalling more furiously. We shall see. 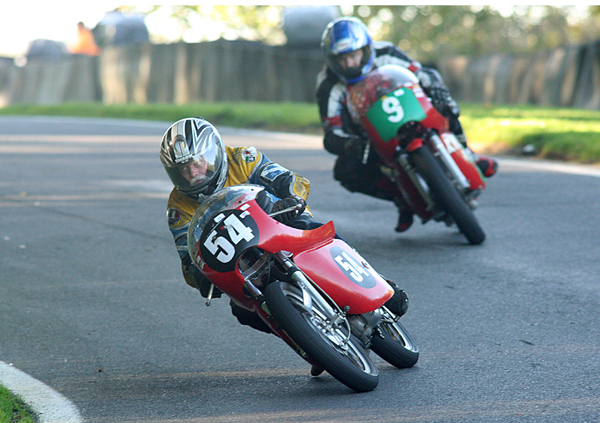 The Cub at Hall Bends. Note the lack of lean angle, could this be the problem with lap times? What a difference a day makes. 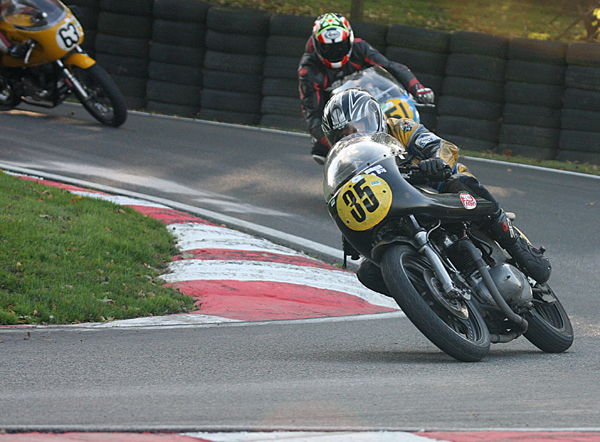 Saturday 9th October at Cadwell Park, weather dry and starting a bit misty but quite warm, getting distinctly colder during the day. 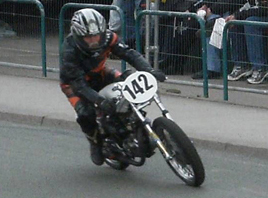 Practice completed without falling off, a quick tighten of a bit on the Cub's carburettor as it was not going as well as hoped, and out for the first two races, in rapid succession. 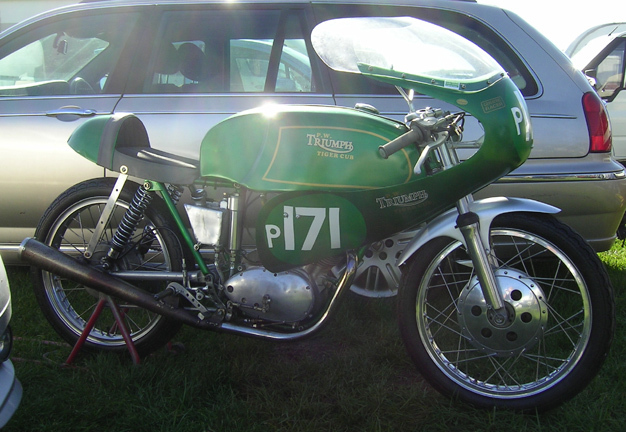 The Cub was still going slowly and came dead last, and the Daytona? 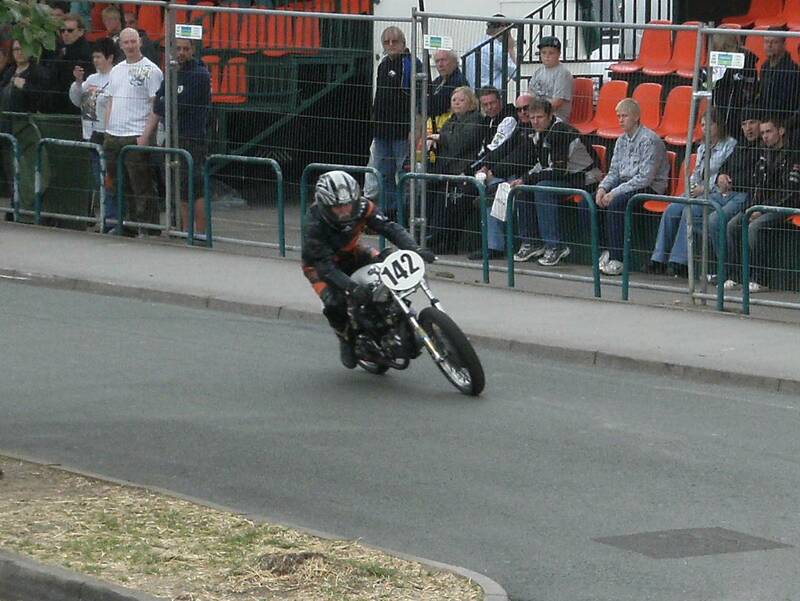 I wasn't allowed out in the race, the organisers had put me in the wrong class. I was allowed a race with the faster bikes, but it was the very last race of the day, my night vision is rubbish, and my lap times were awful. Sunday, and at least it was a bit warmer. 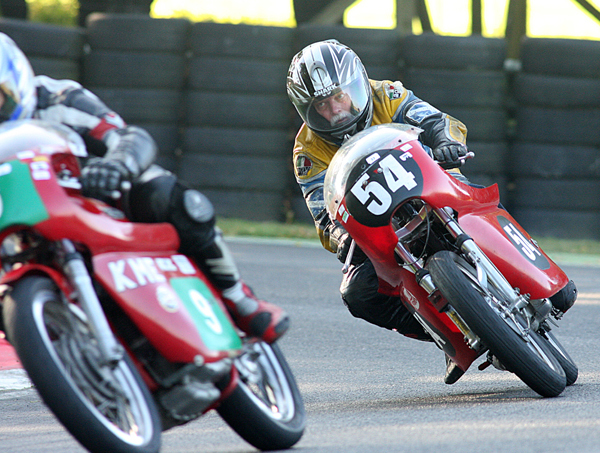 After a word with the race secretary, I could go out in the right 500cc class, but starting right at the back. The realisation had dawned that I had the wrong main jet in the Cub's carburettor, so there was also hope for the main event there, albeit also starting right at the back, as the grid positions were determined by the previous day's performance. The Cub developed a misfire in the Sunday morning race, but it was just a minor electrical problem - overall, it was going much better. Lap times in the morning on the Daytona were back to where they were meant to be, there was added excitement when one of the Suzuki riders threw his bike down the track right in front of me, requiring a high speed and decidedly bumpy trip across the grassy scenery for about 100 yards. 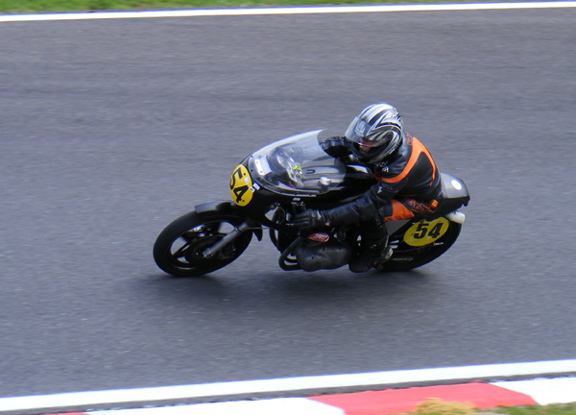 The rider was OK but the bike was quite bent; as his son had blown the engine on a similar bike they set about making one good bike out of two as soon as the race finished, so that at least one of them could get a ride in the afternoon. At this point, a chance came along to make the weekend worthwhile. 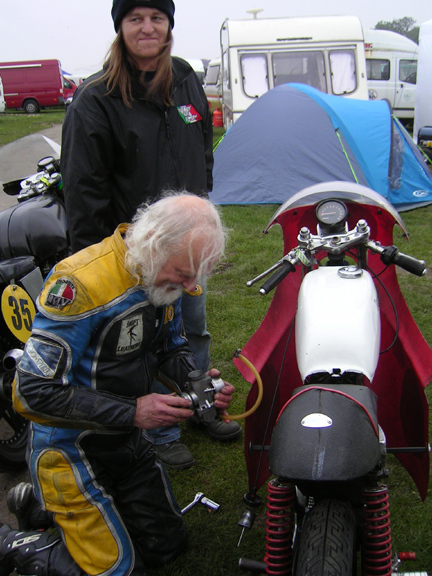 A chap looking at the Cub - as so many do, as so many of us passed our test on one - had one in the parade (where non-racers can take interesting bikes round the track). He had lost a rather specific nut during the noise testing, and was faced with having to go home without having his ride. 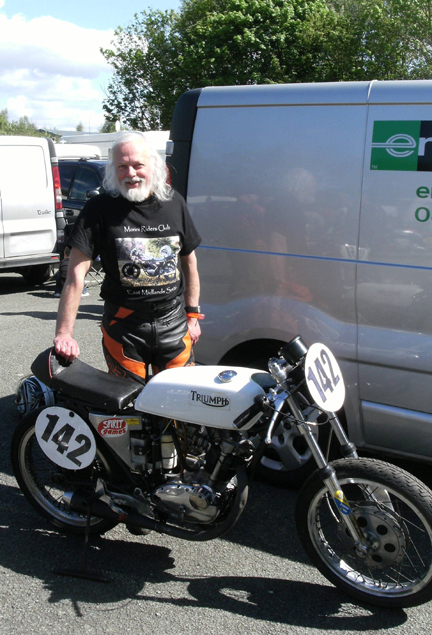 We did not have a spare, but were able to swap bits between our two bikes, so that we could lend him the required part, and still get out for the remaining two races, being the Classic Race of the Year in the two classes. We were getting short of petrol, and we were given some petrol in return, a win-win situation. It transpired that he had his son, daughter and sundry grandchildren there to watch him go round, so the day was saved for three generations. And he passed on some very useful knowledge about Cub tuning, so all in all, a most fortuitous meeting. So finally we came to the main event. 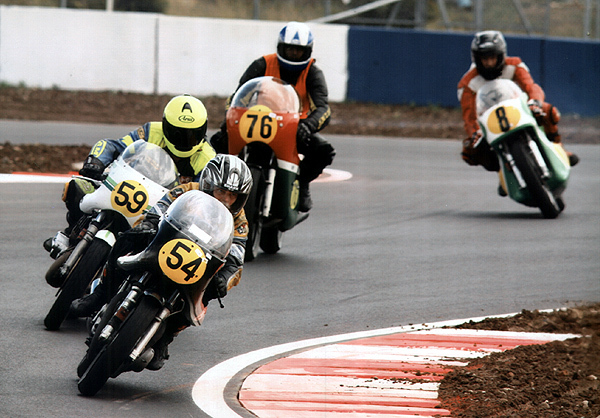 The 200cc class is run with the 250's; there were only a few entrants in our class but with them all being considerably further forward on the grid I had to get past a good half dozen of the 250's to get amongst my lot. 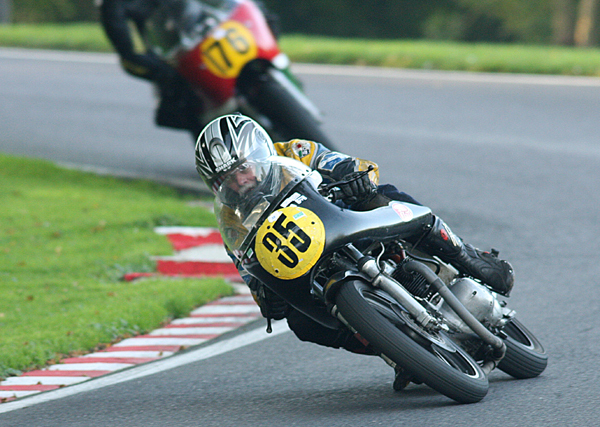 The 250's tend to be quite a lot quicker on the straights, which made for an entertaining time on the bends, having to overtake in a variety of different places until I could eventually get far enough ahead not to lose the position again on the start/finish straight. 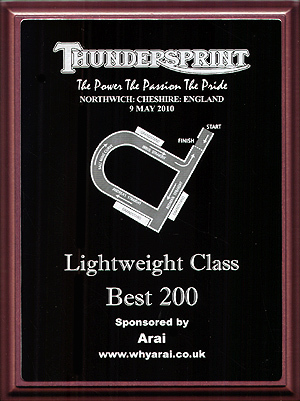 I clawed my way up to grab third place in my class, thus having a small but shiny trophy with Race of the Year on it. Hurrah! 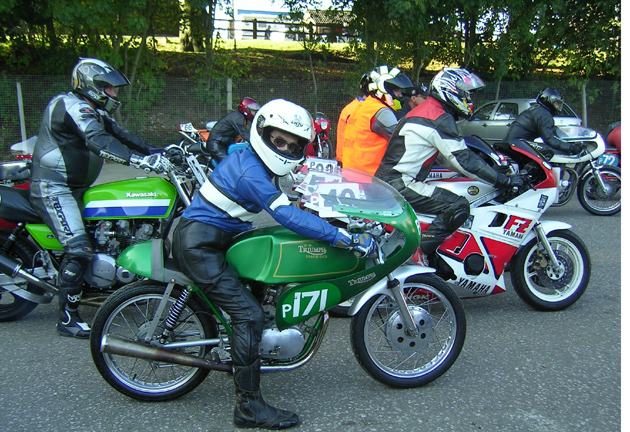 The Daytona's race was similar, except that they were bikes in my own class that I had to overtake. I got past four of them, plus a stray 750 from the other class we were out with; two more were in sight but that back-of-grid starting position made catching them just more than I could manage. In the event, there were three horribly fast bikes way ahead, so 4th would have been the best place available anyway. The main thing is, it was fun, and I'm perhaps not as past it as I had started to suspect. Now, can I find a way to make the bikes go faster next year?